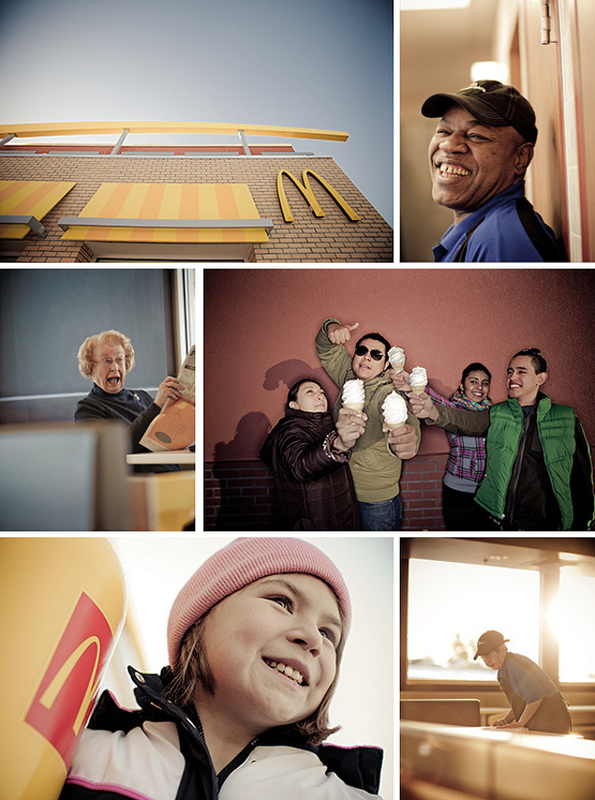 Just when I thought 2009 was over, one last hurrah came up days before the new year to shoot a project for McDonald's. It was also a nice first project to arise as a result of my recent partnership with Paula Gren of Paula Gren Representatives. The project offered more creative freedom than is typical. I was told to "do what I do," within and outside the walls of one of McDonald's newest restaurants; one that features the latest in terms of design and architecture. Upon first glance the interior layout and design reminded me of something one would see in Holland or another northern European country known for their avante garde designs. The overall modern look and feel of the store didn't take away from the time tested expectations of the golden arches. The project involved a pre-shoot casting in the restaurant, gathering a varied pool of "real" talent; everyone from toddlers to teens to seniors. The end product was a library of images - "a day in the life" from an employee and customer point of view. Young and old, people were genuinely psyched to take part. The content we came away with is as unique as the new look of the updated McDonald's. I've got to say whether working or eating - people are truly "lovin it." Recently EightHourDay was asked to be featured in the June 2010 issue of HOW Magazine. The 6 page article will feature an interview with Nate and Katie as well as an array of their work. In maintaining their small business feel they asked me to capture their day-to-day life(style) as an intimate design couple. The shoot took place at EightHourDay's studio and presented a rich palette of options suitable as stand-alone images or as backgrounds for the portraits. As always it's a pleasure to work with talented folks in the industry. I look forward to seeing the article in the summer issue of How Magazine.